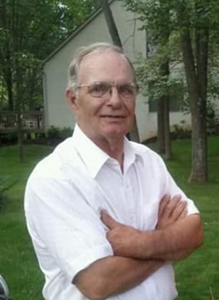 Newcomer Family Obituaries - Roy M. Collinsworth 1946 - 2019 - Newcomer Cremations, Funerals & Receptions. Roy M. Collinsworth, 72, passed away at home, surrounded by family, on Jan. 10, 2019. He was preceded in death by parents, Roy J. Collinsworth and Francis E. Camp. Roy is survived by wife of 48 years, Donna Collinsworth; children, Lori (Joshua) Collinsworth, Sharla (Jeffrey) Denney, Brian Collinsworth, and Todd (Misty) Collinsworth; grandchildren, Charlee and Jessica Biddle and Lakyn Collinsworth; siblings, James, Joe, Carolyn, Tom, Rick, Gary, Kay, Debbie, Mary, and Roy Glen; many nieces and nephews, other family and friends. Roy honorably served in the US Marine Corps from 1965-1969. He was a mechanic in central Ohio and enjoyed hunting and fishing. Roy was a member of the Poor Boy's Bass Club. Per Roy's wishes, there will be no public services. In lieu of flowers, donations may be made in Roy's memory to National Kidney Foundation, Finance Department, 30 East 33rd St., New York, NY 10016. To leave a special message for the family, click the "Share Memories" tab. Add your memories to the guest book of Roy Collinsworth. What more is there to say other than Roy was an amazing man, father and husband! We may have lost Roy here on earth, but Heaven gained a great man! Keep a boat seat warm for me Roy. Prayers sent to all the family. Love you all. I am the widow of Dwayne Wynn, who was a childhood friend. He always spoke well of your family. My sincere condolences. So sorry to hear about Roy. I had no idea that he was as sick as he was. I can remember the two of us jogging together around the streets of West Jeff. My sympathies are with you all. I'm so sorry for your loss! You are all in my thoughts & prayers. May God's love & comfort surround you. I remember Roy being my dad's hunting and fishing buddy. I was never in any military service, but I respect those who served. Semper Fi. He will be missed. Roy, drive that Ford into the great unknown. So sorry for your loss. My thoughts and prayers are with the family.